This spicy chicken tortilla soup recipe is one of my favorite things to make when that first fall chill hits the air. For one thing, the change of seasons means I inevitably get a cold. And there’s nothing like a little ancho chile powder to kick some life back into your stuffy sinuses. 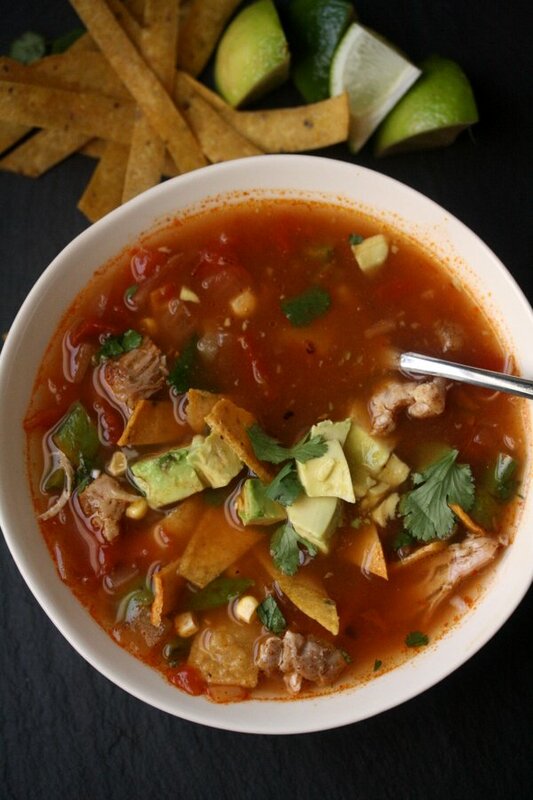 If you’re in the same boat, or if you just like this soothing, spicy Mexican soup, you can now watch me make it on Healthination. Pop over to see this episode of my show Gluten-Free Tasty here. Wow. That is one tasty soup! And the timing is perfect, in the last 3 days we had some serious thunderstorms here in Athens, and the temperature dropped a little. A chicken soup sounds really good right now! I’ll skip the jalapenos as Mirella can’t have any hot spices because of her stomach. But she’ll appreciate the rest of your recipe, that’s for sure! Have a great day dear Phoebe, thank you for another great recipe! THAT DRESS!!!! Such a great job with the video.